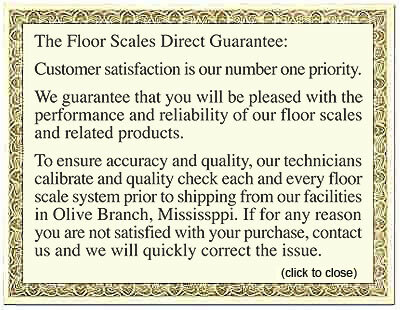 The following are terms of a legal agreement between you and FloorScalesDirect.com (FSD). By accessing, browsing and/or using this web site, you acknowledge that you have read, understood, and agree, to be bound by these terms and to comply with all applicable laws and regulations. If you do not agree to these terms, do not use this web site. Information may be changed or updated without notice. FSD may also make improvements and/or changes in the products and/or the programs described in this information at any time without notice. FSD assumes no responsibility regarding the accuracy of the information that is provided by this site and use of such information is at the recipient's own risk. By furnishing information, FSD does not grant any licenses to any copyrights, patents or any other intellectual property rights. Information FSD publishes on this or any other website may contain references to FSD products, programs and services that are not available in your country or through your sales channel. Such references do not imply that FSD intends such products, programs or services available in your country or through your sales channel. Consult your local FSD sales office or authorized distributor for information regarding the products, programs and services that may be available to you. FSD does not make any representation whatsoever in regards to any other Web site which you may access through this one. When you access a non-FSD Web site, even one that may contain the FSD-logo, please understand that it is independent from FSD, and that FSD has no control over the content on that Web site. In addition, a link to a non-FSD Web site does not mean that FSD endorses or accepts any responsibility for the content, or the use, of such Web site. It is up to you to take precautions to ensure that whatever you select for your use is free of viruses or other destructive items. In no event will FSD be liable to any party for any direct, indirect, special or other consequential damages for any use of this web site, or on any other linked web site. FSD provides all information on an "As Is" basis only. FSD may at any time revise these terms by updating this posting. By using this web site, you agree to be bound by any such revisions and should therefore periodically visit this page to determine the then current terms to which you are bound.